Jeremy Reynolds knows every little bit of local knowledge helps when it comes to competing for endurance riding's most prestigious title. So he set out on a short jog Friday morning along the final few miles of the Western States Trail near the Auburn staging area. The extra homework paid big dividends Saturday night as the 2004 Tevis Cup champion chased down 2006 Tevis winner John Crandell. With only the moonlight illuminating the trail, Reynolds jockeyed past Crandell over the final half-mile of the 100-mile race from Robie Park in Truckee to Auburn, claiming his second Tevis title atop CV Eli. "I'm glad I couldn't see the ground," said Reynolds, who was three minutes behind Crandell at No Hands Bridge. "I think I just chose the correct line, that's what it came down to. We were flying through crazy stuff and pretty much just letting the horses go at that point. I know there's ruts and rocks, but my horse was game." Crandell made a valiant run at becoming the first rider since endurance riding pioneer Wendell Robie to win the race in back-to-back years on different horses. He won on Heraldic last year and rode HH Saba Shams on Saturday. Robie, the Auburn businessman who left his mark on the Auburn Ski Club, the Tevis Cup and the Western States Endurance run, won the first four Western States Endurance Rides. Robie rode Bandos in 1955 and '56 and Molla in '57 and '58. The Lloyd Tevis Cup was not awarded to the winner of the ride until '59. It took a remarkable effort from Reynolds and Eli, a 12-year-old Arab gelding, to overtake the defending champion. "John Crandell is probably one of the top two riders in the U.S.," said Reynolds, who lives in Los Gatos. "I just kept saying to myself, 'I can win, I can win.' I was watching John's horse all day and that horse was amazing. I think I just made a couple better choices, it was probably luck more than anything." There were three talented riders dueling for the Tevis Cup down the stretch. Reynolds tied for the Tevis Cup in 2004 with Becky Spencer, a year after his wife Heather won the ride's top prize. Suzanne Huff, from Carson Valley, Nev. was alongside Reynolds, just behind Crandell up until the Poverty Bar Crossing checkpoint with just 12 miles to go. Huff was the American Endurance Ride Conference series champion last year in the 100-mile category and a former Auburn resident. Greenwood riders Ken Keele and Kassandra DiMaggio were the first two riders into Robinson Flat, where all participants were required to rest for one hour before departing. Stagg Newman rode his horse Jayel Super into Deadwood - 55 miles into the ride - nearly 30 minutes ahead of Keele. But Newman's day ended there when he was pulled. Crandell was the first rider to arrive at the new Chicken Hawk/Volcano checkpoint, where the Western States Trail Foundation is working on a new trailhead that will provide unprecedented access to the area. Crandell departed the Chicken Hawk/Volcano checkpoint with an 8-minute advantage on both Heather and Jeremy Reynolds. Heather was pulled at Foresthill after her horse ran into trouble with one of its hooves. Crandell led the race out of Foresthill after another one-hour layover; departing at 5:30 p.m. Huff was right on Crandell's heels heading out of Foresthill just four minutes behind. Jeremy Reynolds left four minutes later and Loomis' Tom Johnson left the last major aid station at 6:02. As of press time, Huff was the only other rider across the finish line. The riders have until 5 a.m. today to finish the ride. An awards barbecue will be held at the Gold Country Fairgrounds at 1 p.m. today. Elizabeth Weston, known as Liz, is ready to ride - 100 miles on horseback during Saturday's 52nd annual Tevis Cup ride. For her Colfax High School senior project this year, Weston, 18, learned endurance horseback riding under the tutelage of Terryl Reed, an experienced endurance rider. To qualify for entry into the Tevis Cup, a rider must complete at least 300 miles of long distance rides, each 50 miles or longer. "This has been a life-changing experience," Weston said. "What started as a 15-hour senior project has consumed my entire summer with training. Now I'm riding in the biggest endurance event in the country. I'm nervous and sometimes can't sleep." The first time Weston completed a 50-mile ride, "she could barely finish it," Reed reminisced. "At the 45-mile mark, she could hardly move - we had to encourage her to get back on the horse. Now, she finishes 50s with a smile on her face." But, according to Reed, the 100-mile Tevis Cup will test Weston's desire to finish because it takes determination, fortitude and strength to complete a ride of this nature. "I know she'll do it," Reed confidently said. "She's a very good student. And, over the past month or so, Liz and Kian have formed a bond. If you're going to ride 100 miles, the rider and the horse better get along well. They need to become one and work together as a team - like dancers." Weston indicated that Kian, a 900-pound Arabian belonging to Reed's sister, Lori, was difficult at first. "He was kind of a jerk but I got tough with him and now he understands me and stopped trying to take advantage of me," she explained. "I think we'll have a really good time on the ride." Reed said the Tevis Cup is considered the No. 1 endurance ride internationally in terms of technical difficulty. The course features miles of rocky downhill trail and hours of night riding, imposing stress on both the horse and the rider. The ride begins at the Robie Equestrian Park a few miles east of Squaw Valley, then connects to the Western States Trail and finishes at the Auburn Fairgrounds. Weston hopes to complete the ride within 24 hours, which would include 21 hours of riding and a few hours at the various rest points. It's not unusual for the most experienced riders and horses to be pulled for a variety of reasons. In fact, the completion rate is 50 percent because horses must successfully pass several vet reviews where professionals check for pulse rates, lameness, fatigue and weight loss. Reed said that, according to American Endurance Ride Conference data, the mental stress is unlike any other ride. Practice riding in the dark of night is a key training element for the Tevis Cup, which is always scheduled for a night with a full moon. But this is not necessarily true of practice rides. Weston's first solo night ride was very dark, with no moon and no one else around. "It was spooky," she said. "You can't even see the trail but the horse can see with his good night vision." Endurance riding requires more than trail-riding skills. A well- informed crew is essential to a successful ride. And, according to Reed the crew needs direction from the rider. As a result, Weston learned management skills, too. "My goal was to make Liz independent and able to make her own decisions," Reed said. "She has had to convene and manage meetings with her crew so they'll understand their roles during the actual ride." Weston has a crew of eight or so who will take care of Kian during the vet checks and resting points so she can get a break. Training the crew is all part of the experience. "Even if Liz doesn't turn out to be an equestrian," Reed said, "she'll be able to use what she's learned throughout her life." Though Weston grew up with horses, her real passion is the theater. She plans to attend California State University at San Francisco this fall to pursue acting and costume design. But, Weston pointed out, this has been a once-in-a-lifetime opportunity: "I'm off to college next year, and who knows? The next time I might have a chance to do something like this is 20 or 30 years from now." This year’s Pan American Championships were hosted by Brazil. The majority of the events were held in Rio De Janeiro but the Endurance section took place in the town of Campinas, found approximately 80km North West of Sao Paulo. The competition had a smaller number of entries than previous years with no representation from any of the Northern American Nations. Just under 50 combinations started the race, shared between the Senior and Young Rider/Junior classes. The region had experienced abnormal weather conditions for the time of year with torrential down pours, and high humidity. Concerns for the condition of the track and vet gate were raised, but the course held out well and no problems occurred. The event had been mainly organised by Elizabeth van Schelle, Deputy Chair of the FEI Endurance Technical Committee. Horses were stabled on one of Elizabeth’s farms, and the track stayed within her estate at all times. Whilst in previous years the Senior Competition had been over 160km this year the decision was taken to hold both the Senior and Young Rider/Junior categories of the FEI CEI 4* Regional Championships over a distance of 120km. The course was made up of 4 loops with a final loop of 27km. The trail was over a fairly flat landscape with light undulations in some places. The track itself consisted of mainly dirt roads which was lucky due to the adverse weather conditions! The competition started at 6.30am on Friday 20 July. The fastest completion of the day was by a Young Rider. Laura Paiz from Guatemala, 20 years of age and in her last year as a Young Rider competitor, stormed to victory with the 9 year old bay gelding Nico in a time of 05h48. Whilst the horse is based in Uruguay the pair had previously competed together in the Young Rider World Championships in Argentina earlier this year. The pair had finished in 20th place in a time of 06h06. Paiz had a flat out racing finish clinching the title by one second over her rival Mariano Pita from Argentina with Chaval PP. This combination are currently having a wonderfully successful season, this will be the 4th win of the year for the talented pair. The chestnut gelding has won every one of his FEI rides he has entered, winning over distances of 80km, 100km and 120km. Mariano and Chaval PP are currently in 2nd position in the FEI Young Rider Combination Rankings. Bronze Medal went to Uruguayan competitor Marcela Ott and Baraka Sharjah who completed the distance at 19.09kph, 31 minutes behind gold and silver. This was the third completion of 120km for this pair, having previously taken 2nd place in Durazno in October last year, and winning the YR 120km class at Costa Azul two months ago. The Senior Gold Medal went to the Home Nation, rider Alexandre Leco Razuck with his mount HDL Pantheon took victory at a speed of just over 20.7kph in a time of 05h49. This is by far the most successful completion for the pair, although clinching 1st place in Bragança Paulista in April the overall speed was considerably slower. The pair had also been selected to represent Brazil in the FEI World Equestrian Games in Aachen last year but were unfortunately vetted out on lameness. An ecstatic Razuck, holding his National Flag aloft, crossed the finish line with his grey gelding looking fresh and well. Twelve minutes after the arrival of the first place combination another Brazilian Rider came home to take Silver. Maria Vitória Lins Liberal and Filoteu Rach completed the course at 20kph, another personal best. This was only the second outing at an FEI event for this 8 year old gelding. They had finished in 3rd place in Paraopeba in May finishing the 120km in 07h05. Federico Garcia Pineyrua with EO Dubut, from Uruguay, prevented the Home Nation from taking a clean sweep and finished 5 minutes ahead of the next Brazilian rider. This was the fourth completion over this distance for this combination, adding a third place to their already impressive list of two first positions and a seventh position. Although it was the first FEI competition for the combination this year they finished with a final riding time of just 06h04. The Senior event fielded a line up of 27 combinations from seven nations, ARG, BRA, CHI, COL, GBR, RSA and URU. 56% of the combinations finished the race with the final horse finishing 3h43 minutes behind the first horse. An impressive finishing rate despite some surprising eliminations. Mercedes Tapia, currently in 7th position in the FEI World Rankings and who had finished 2nd in the Pan American Championships in Argentina in 2005, unfortunately didn’t complete the course with her mount Ras Fugada. Mario Schioppa who had won Bronze in 2005 in the YR category of the Pan American Championships also failed to complete. Both foreign entrants finished well. Carmen du Preez (RSA) with Nag Sharon Bez finished in 11th position with a speed of 16.56kph. Dominique Freeman (GBR) had made the long journey to Brazil for the second time this year completing in 14th place with Roger HCF whom she previously partnered to 7th position in Bragança Paulista in April this year. The Young Rider/Junior Event had a great finishing rate of 67%. Four Nations were represented, each one having a finisher in the top 4! Gold to GUA, Silver to ARG, Bronze to URU and 4th place to BRA. 14.62kph was the slowest speed of the day for the Young Riders. Rider Karina Camargo Arroyo (BRA) who had finished in 1st place in the Young Rider World Rankings last year finished in 8th position whilst Maximillian Montes de Oca, who had finished 2nd in last year’s Young Rider World Rankings had finished in 12th position with El Sheik, his talented 9 year old gelding. This pair have shown a consistent completion rate with no fails since the horse completed his 1st FEI Ride in 2005, 1st position in the YR 120km in April. The team competition was dominated by the Host Nation. Gold in both the Senior and Young Rider Category. The Young Rider team won their Gold by over 2 hours. Bronze went to Uruguay who had two of their young riders finish the course. In the Senior Race, Brazil was the only nation to get a full team of 3 riders round. This time Silver went to Uruguay with two finishers. No Bronze was awarded as Argentina only had one finisher. Young Leslie Hagen with horse Cashmere, their first taste of the International Scene, kept a cool head and brought her grey mare home, the only completion for her country. Full results of the competition will be posted as soon as possible. Tom Johnson is one of the more accomplished athletes in history when it comes to negotiating the Western States Trail on two feet. Atop a horse, it's Johnson's wife Marcia Smith that owns the bragging rights in their Loomis home. Johnson will make his latest attempt at becoming the first person to win both the Western States 100-mile Endurance Run and the Tevis Cup on Saturday. "When you're running, it's really pure," said Johnson, who won the Western States 100 in 1990, '91 and '93. "If you didn't do the training, there's no one you can blame but yourself. In Tevis, you're responsible for your partner out there for 20 hours or more." Smith hasn't had many bad days during the 100-mile ride from Robie Park in Truckee to Auburn's Gold Country Fairgrounds. She's finished fifth or better in five of her seven starts, winning the Tevis Cup three times and the Haggin Cup - which goes to the best-conditioned horse in the top 10 - once. Smith will be heading up her husband's crew this year as the two agreed long ago to alternate the years in which they compete in the ride. "Marcia's my crew chief, my strategist and moral counsel," said Johnson, who has two Tevis Cup finishes in six tries. Johnson believes he's got a good shot at competing for the elusive title on Saturday. He'll be riding Al-Marah Sands of Time, an 11-year-old Arabian mare on loan from Al-Marah stables in Tucson, Ariz. Smith rode "Sandy" to a fifth place finish last year and the horse is the offspring of Shellie Hatfield's Tevis-winning mare, AM Xanthium. Hatfield and Smith tied for the Tevis Cup in 1992. Johnson described Sands of Time's personality as, "A valley girl that's ready to rock and roll." "She's got a teenager's demeanor," he said. "But she's really tough too." The International Equestrian Federation's (FEI) overhaul of endurance is in full swing, with six working groups now assessing the rules and a successful trial of a "Formula One" finish. The vast growth in the sport, at all levels, and a number of equine deaths in recent years led to the World Endurance Forum in Paris this spring, at which an overhaul of the sport was agreed. Current endurance rules date back to 1980, since which time the sport has grown massively. "All aspects are open for discussion, but the welfare of the horse is to be increased wherever possible, as is professionalism in the sport," said Ian Williams, FEI head of endurance. Three trial events have taken place so far: a scientific study of endurance horses in Dubai; a trial in Portugal using four vetgates instead of five; and the latest, a test of the Formula One finish at a recent three-star 120km ride in Italy. The trial entailed gradual closing of vetgates 1hr after the first horse crosses the finish line. Vet gates presently remain open until the last horse has finished. "If adopted, it will have another name, but the trial had very positive feedback," said Mr Williams. "We will need to trial this style of finish over 160km to get a full picture." The last trial, of 120km for a championship (normally 160km), will take place at the Pan American Games in Brazil next week. In June, 18 experts were appointed to review six different areas of the sport: qualification, organisation, equine protection, education, legal controls and competition structure. Britain's John Robertson, a top-level FEI endurance judge and technical delegate, is chairing the competition structure group, aided by German-based Juliette Mallison and Brazilian Antonio Llompart. "The FEI purposely chose people worldwide, so most discussion will be done by e-mail and phone," said Mr Robertson. "We're looking at the responsibilities of technical delegates, which have never been defined; at the Formula One finish and the best condition award, which is more highly thought of in some countries than actually winning the race." Each task force must provide the FEI with monthly updates, a progress report in October and, by early 2008, full recommendations. Mr Williams and his team will then compile a new rulebook, to be circulated to national federations next summer. It will be amended and then approved by the FEI general assembly in late 2008. "These things are often allowed to slip, but the FEI is anxious this does not happen," said Mr Robertson. The beautiful town of St Galmier played host to the FEI CEI 3* 164km and French National Championships last Saturday. The weather forecast had promised a hot weekend, and they were absolutely correct. The international field of fifty four riders from ten nations had to endure temperatures of up to 40 degrees combined with a tough track resulting in a true test of endurance. The competition truly highlighted the highs and lows that endurance has to offer. The route was over 6 loops, the longest of which was 35km and was tackled first. The start and finish of each loop was along the race course at the central vet gate within the hippodrome of St Galmier. photo: TOP RIDER: Temuka man Bryan Priddle took out three trophies at the recent national endurance horse riding awards dinner in Christchurch. A Temuka horse rider reined in a swag of trophies at the Endurance New Zealand awards dinner in Christchurch recently. Bryan Priddle scooped the senior section of awards, winning three trophies – distance rider of the year, distance horse of the year and best horse and rider combination. "Everyone else said it wasn't fair I got the lot," he laughed. While the trophies may reflect a strong season for the Temuka man, he has also been a consistent performer at national level for a number of years. Mr Priddle began endurance riding about 14 years ago. With his children already involved with the sport, he became sick of standing on the sideline and decided to give it a go for himself. While living in Temuka, he rides horses for Glendaar endurance racing, which is based in Herbert. On his way to winning the distance rider of the year Mr Priddle clocked up 1460 competition kilometres. However, riding six nights a week the number accumulated is in fact far more. "You probably do a couple thousand (kilometres) over a year with training," he said. The highs in the sport also come with lows and Mr Priddle has certainly had his share of both. In the recent Trans-Tasman Challenge in Nanango, Queensland, Mr Priddle was selected as a member of the four-strong Kiwi team. However at the 125km mark of the 160km event Mr Priddle was unfortunately eliminated following a veterinary inspection. "I was brassed off. He was going like a dream too." The disappointment has again been overridden with the success of scooping the overall season's awards however and Mr Priddle is already back in the saddle training for the upcoming season due to start next month. This year he is aiming for good results in the national event, which will be hosted by his Mt Nimrod club and held on home ground near Kurow at Easter. 2007 PanAm a Race to Remember! 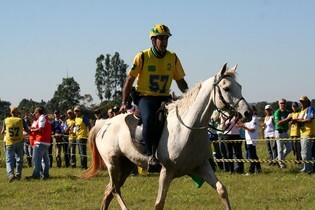 Alexandre Leco Razuck of Brasil riding HDL Pantheon finished first in the 2007 PAN AMERICAN & OPEN ENDURANCE CHAMPIONSHIP that was held today, 20 of July, in Campinas - State of São Paulo. forwards us Images and the Results of a Beautiful Brasilian Ride! Brasil Captures Team Gold in the Senior & Young Rider Competitions as well. Gold in the Young Riders race went to Laura Piaz of Guatemala riding Nico in a close run-off with Silver medal winner Mariano Pita of Argentina riding Chaval PP. photo: MEDAL WINNER: Renee Saxby blitzed the Trans-Tasman Federation Equestrian Internationals as a member of the Australian team. IF HORSE racing is the sport of kings, then endurance riding is the sport of Sheiks and local Sandy Hollow resident, Renee Saxby, has brought home another gold medal for Australia after blitzing the Trans-Tasman Federation Equestrian Internationals (FEI), as a member of the Australian team. Renee's latest success gives her the chance to qualify for the World Championships to be held in Malaysia next year. The host of next year's event, the King of Malaysia, joined the Trans-Tasman ride to help sure up his own qualification to ride in his home country for the Championships. Renee said the support that the Malaysians gave the Australian team was fantastic. "The king had a lot of supporters with him and every time we stopped at a check point the Malaysians would yell "Aussie, Aussie, Aussie, oi, oi, oi"," laughed Renee. "I rode with the King for about 100ks and he was very nice," she said. "He is actually going to pay for six Australians and their horses to go to the championships next year, which is incredible," said Renee. Australia holds the most team medals in international endurance events. Internationally the sport has the largest membership of any horse sport and in Australia it is now the fastest growing equine discipline. Renee only began endurance riding in 2001 and is as passionate as she is successful in her new sport. "You need to be mentally a bit tough to be out at night alone for six or seven hours without anyone else in sight, you certainly get a good bond with your horse," said Renee. "Not a lot of people get up at night put a light on their heads and ride for 100ks," she laughs. "At the last event my team member and I rode for three quarters of a leg in the middle of the night without seeing anyone and we started to get a bit worried; we wondered if we had missed an arrow and were actually lost, but thankfully we were on the right track," she said. Renee said that competing in Australia prepares them well for competing in the Middle East, where the sport is extremely popular. "Racing in the Middle East is incredible," said Renee. "You actually have four wheel drive support for each rider that drives with you on the course and is ready to give you whatever you need," she smiled. "They will hand you food and water out of the car, you can find out how fast you are actually riding by looking at the speedo, you can even ask them to drive to the nearest riders to calculate how far ahead or behind you are. "The prize money overseas is huge and various royal families over there all enter the events to race each other," she said. There is no prize money for endurance events in Australia, so many competitors need to go oversees to compete well in their sport and the Australian bred horses are well sort after by many Arab buyers, so many Australian competitors end up selling their horses. Some Arab buyers are interested in Cherox Assassin, affectionately known as Killer, so Renee will need to decide if Cherox would prefer to ride with her in Malaysia or relocate to the lap of air conditioned luxury in the Middle East. Many international riders arrange to ride horses in the event country, rather than the often prohibitive costs of taking their own horses with them. ALGIERS - Botswana Endurance Association have lodged a formal complaint with the organisers of the 9th All Africa Games concerning unlawful awarding of team medals during the endurance horse riding competition. The horse riding competition formed part of the All Africa Games currently taking place in Algiers, Algeria. Sharon Du Plessis, who is the associations president as well as the teams manager, said in an interview that their ground of discontent emanated from the awarding of medals to both Libya and South Africa under dubious circumstances. She pointed out that the organisers reneged on the rules that were set for the games. She said the agreement for a team to be awarded a medal should consist of four riders, adding that at least of the two riders had to successfully complete the event. Although South Africa participated in the team, only one of their riders completed the riding. One of their riders completed the race having been accommodated consistently by the officials of the event to the disposition of all other participating competitors, she said. It also remains a mystery that Libya was awarded bronze medals having entered only one participant in the event. Meanwhile, the local equestrian team did not do well as they had anticipated. Although it was the first time to feature in games, she was optimistic that they would do well but were done a blow when the organisers started employing underhand tactics. She said their dismal performance was also compounded by the fact that they had to use the horses provided for by the organisers. The horses we found here are not up to the expected standard and they could not finish the races. Even though they had wished to bring their horses for the competition, she said it would have been expensive to do so. 3 July 2007, Kuala Lumpur - The fifth annual ride of the much anticipated Edaran Endurance Classic will be held from 26--29 July 2007. As the foremost endurance ride in the country, the EDARAN ENDURANCE CLASSIC has decided to hold its 2007 ride at the Terengganu International Endurance Park in Lembah Bidong, Setiu, Terengganu, the venue of the World Endurance Championship 2008. This decision was made to give full support to the world event. This year's ride will be jointly organized by Yayasan DiRaja Sultan Mizan (YDSM) and Edaran Digital Systems Berhad (EDARAN). Edaran Endurance Classic 2007 takes on a special significance and will provide the opportunity for riders to obtain their certificate of competitiveness (COC) to be able to participate in WEC 2008. At the same time it provides foreign riders the opportunity to familiarize themselves to riding conditions in tropical condition. The ride anticipates a good number of riders including international riders who will be training to qualify for the WEC 2008. Foreign riders who have regularly participated in the EDARAN ENDURANCE CLASSIC rides have continued to bring with them a wealth of experience and skills in the sport of endurance riding. "Foreign riders present real benefits to the sport of endurance riding in Malaysia through the sharing of knowledge and technical ?know-how' and we are happy to welcome them to our rides," said Dato' Abdul Hamid Mustapha, the Joint-Chairman of the organizing committee. "We are most privileged and honoured to have the involvement of YDSM as Joint-Organiser of this year's ride, especially because the State of Terengganu will be the Hosting State of WEC 2008. The keen and committed involvement of the YDSM has enabled the organizing committee to hold the event outside of its traditional base in ar-Raudhah Equine Centre, Selangor. This is indeed a most valuable and exciting experience for all involved in the event ," said Dato' Hamid Mustapha. "Winning the bid to host the WEC 2008 did not come without effort and due credit must be given to His Majesty The Yang DiPertuan Agong for playing a key and major role in winning the bid. It is now the responsibility and duty of all of us to ensure that the WEC 2008 is held successfully if Malaysia is to enjoy the benefits of hosting this world class event," said Dato' Hamid Mustapha. Dato' Hamid added that main objective of the EDARAN Endurance Classic 2007 is to keep the momentum of international interest in and awareness that is building towards WEC 2008 in Terengganu.
" We believe that Malaysia's hosting of the WEC 2008 is a chance in a lifetime opportunity to showcase our country's capabilities as a host and organizer of a world class sports event like the WEC" said Dato' Hamid . "It is our hope that through rides like the EDARAN ENDURANCE CLASSIC 2007, we will be able to contribute towards a successful hosting of WEC 2008. " added Dato' Hamid. Joint -Chairman Dato' Seri Dr. Salleh Mohd Nor applauded EDARAN for choosing to hold the Ride at the official venue of WEC 2008. He said that this year's Ride has also been ideally timed to build up momentum for the official trial ride that will be held in November this year. "The YDSM is very happy to be involved in the Ride. Holding the event in Terengganu will not only provide riders the opportunity to train and familiarize themselves to riding conditions in Terengganu but equally important, it will provide the opportunity for our local support crew and event managers and organisers to learn and prepare themselves for the WEC 2008. This ride, in many ways, can serve as a ?trial' event from which we can identify areas that may need further improvement and preparation for the WEC 2008," said Dato' Seri Dr Salleh Mohd Nor. Endurance: The host nation won two gold and one silver in the endurance equestrian event. The Algerian trainer praised the result as "outstanding", with rider Karim Djabli on Boheira taking gold in the individual event. Abderrahmane Saidi on Kalbi took silver in the same event, while the Algerian team of Karim Djebli, Ahmed Fayed, Mohamed Rabei and Rafik Bdidi earned the team gold. The bronze in the individual event went to Libya’s Khaled Terhoune on Feqir. In team competition, South Africa won silver and Libya took the bronze. The twenty-one riders from South Africa, Botswana, Kenya, Swaziland, Libya and Algeria taking part in the endurance event rode a distance of 50km on Saturday and a further 50km on Sunday, starting and finishing at Maramane. ALGIERS (Reuters) - Kenya raked in five gold medals in Paralympic athletics to put pressure on the medal leaders at the end of the fifth day of the All Africa Games on Sunday. Two Kenyan gold medals from Samuel Muchai (1,500m) and Abraham Tarbei (5,000m) put the east African nation renowned for its distance running prowess in a good position with a total of six golds in all events combined. Algeria, South Africa and Tunisia were runaway leaders at the end of the previous day with 16 gold, 11 silver and 16 bronze, 15-10-11 and 11-11-14 respectively. Muchai led a Kenyan medal sweep in the race for the totally blind in 4:15.16 as Henry Wanyoike, who won the 5,000m the previous night, added silver in 4:22.01. Francis Thuo, second to Wanyoike the previous day, completed the haul in 4:22.51. Tarbei added Kenya's second Sunday gold in the 5,000m for the partially blind in 15:25.45. He finished ahead of Ethiopia's Tesfalem Gebru (15:29.30) and Tunisia's Fauzai Mohamed (15:46.16). Algeria's Abiza Amine won the 1,500m for the partially blind in 3:59.96 ahead of Kenya's Henry Kirwa who timed 4:00.50. In Blida, Algeria's horse-riding team snatched two gold medals on Sunday, one in the individual event and the other in the team event, as well as a silver medal in the endurance event. Algeria's Djabli Karim, riding "Boheira", won gold in the individual event. Nigeria beat Egypt 3-0 to win the women's team's table tennis gold at Rouiba. In a women's group B soccer match, Ghana beat Senegal 3-0 at the Stade Omar Hamadi Bologhine to join Nigeria in the semi-finals. Celine Schwart on King Farhoz de Paute achieved the Championship of France on Saturday at the St. Galmier course. They held a steady pace with a group of 8 riders through the day. The final phase of the race saw a speed of greater than 23 km/hr as the 2006 Champion Jack Begaud on Kheopsy du Pilat pushed hard. Verginie Atger on Kaena and Jean Luc Riou on Lasco du Prat both pushed hard to catch the front runners, competing the 6th phase in 24.51 and 24.76 km/hr respectively, but fell a bit short. a 1 second differential between Begaud and Atger, followed by Riou 10 seconds later decided 2,3,4 in this 164km endurance race! by Peter Ibrahim Abisheganaden. Photos by Natasha Mustapha. The 5th Edaran Endurance Classic was launched today with an endurance horse and rider mounting up at Saffron Restaurant in Bangsar, Kuala Lumpur. For the first time, the Edaran Endurance Classic will not be held at Ar-Raudhah Equine Centre, its home for the first four editions. In support of Malaysian endurance, the Edaran Endurance Classic will instead be held at the Terengganu International Endurance Park in Lembah Bidong, Setiu, Terengganu, the venue of next year's World Endurance Championships, from 26th to 29th July 2007. In moving the event to the WEC course, it gives Malaysian and visiting riders a chance to familiarize themselves and prepare for next year’s World Championships. As a CEI 3-Star 160 km event, it provides riders with another opportunity to gain their first stage of the Certificate of Capability that is required for participation in the World Endurance Championships. Malaysia currently has eight riders who have obtained the first stage of the CoC by completing a 3-Star event inside 13 hours 20 minutes at a speed of 12 km/h. They are Nik Sabaruddin, Dato’ Abdullah, Faizal Ismail, Zul Sha’ari, Hj. Shu’aib Ishak, Amir Abdul Ghani, Nadiah Tajuddin Ramli, and the Seri Paduka Baginda Yang Di-Pertuan Agong. A field of 20 riders is expected for both the 160 km and 20 km rides. Both are FEI recognised 3-star events. The 120 km ride also serves as a Junior and Young Rider international event. There are also 80 km and 40 km rides. A total of 120 riders are expected to take part in the various categories. Five foreign riders from Australia, Belgium and U.S.A. are expected at the event. In response to an Equestrian.Com.My question, we were told they would ride Ar-Raudhah owned horses. “Foreign riders present real benefits to the sport of endurance riding in Malaysia through the sharing of knowledge and technical “know-how” and we re happy to welcome them to our rides,” said Dato’ Abdul Hamid Mustapha, the Joint-Chairman of the Organising Committee. He also welcomed Dato’ Seri Dr Salleh Mohd Nor as the Joint-Chairman. Dato’ Seri Dr Salleh Mohd Nor represents Yayasan Di-Raja Sultan Mizan, who run the Terengganu International Endurance Park venue. In the Question & Answer session, Equestrian.Com.My asked if there were any participants from Sabah, specifically Melinsung Ranch. The response from Competition Director Mohamad Din bin Mat was that whilst they had been invited, they were not expected to attend. LEADER of Al Khaldiya Stables team Shaikh Khalid bin Hamad Al Khalifa finished sixth in the St Galmier Endurance Race for the Bahrain Cup, held yesterday in France under the supervision of the International Equestrian Federation. The 120-kilometre race was won by Inora Paulgans of France, who bested 91 other riders from the Czech Republic, Brazil, Britain, Denmark and Bahrain. Shaikh Khalid presented the Bahrain Cup to Paulgans at the end of the race, which consisted of five stages: the first was over 35km, the second 30km, the third 20km, the fourth 29km and the fifth for 10km. Shaikh Khalid's Al Khaldiya team included Yousef Taher, Ahmed Abdulsamad, Ahmed Abdulla and Jaffer Merza. Leader of the Bahrain Royal Endurance team Shaikh Nasser bin Hamad Al Khalifa phoned Shaikh Khalid to congratulate him for the result and his excellent effort and performance. The six selected Chairmen of the newly established FEI Endurance Task Force held conference calls over the last two weeks to discuss and agree on their respective timetables and reporting procedures. Each Chairman, together with their two co-members, will now start to review the various areas which have been designated to each Division. Specific email addresses have been established so that National Federations can send any comments and suggestions they may received from their members directly to the Task Force Chairman. Regular reviews will take place each month after the respective Chairman has provided the FEI with an updated report on the progress achieved. These reports will also be featured on the FEI Endurance Web pages. A fuller report will be issued in October 2007 which is the half way point in the review process. The final report is scheduled to be released in March 2008 when the proposed new rules will be circulated to National Federations for comment and feedback. Those new rules will come into force in January 2009. The 2007 Edition of the French National Championship will occur this Saturday. The Hippodrome in St. Galmier will be the primary venue of this event. Top international endurance horse Vlacq Khamul has been put down after a "catastrophic" pastern injury. The 12-year-old pure-bred Arab, known at home as "Kham", was owned and ridden Tricia Hirst from Meifod, Powys. The pair had competed around the world — most recently as part of Team GB at the World Equestrian Games in Aachen (August 2006). "I am absolutely devastated," international endurance rider Tricia told H&H. "He was a horse of a lifetime — he took me around the world to places I never thought I would go to." Kham was destroyed on Saturday at Rossdale & Partners in Newmarket where Tricia had taken him for a second opinion for a niggling lameness in his left fore. "We'd had X-rays, nerve blocks, everything — but our vet found nothing, only a small hole at the back of his pastern," said Tricia. "So, because I was competing at Euston Park over the weekend, which was fairly near to Rossdales, I took him there for an MRI scan. They did more X-rays and an MRI but found nothing. "So Marcus Head said he wanted to do another lameness work-up from scratch, starting with nerve blocks." Tricia set out on the Euston Park ride with her daughter, but received a call on Saturday to say that the Arab's pastern had catastrophically broken down in front of staff during the trot-up. There was no choice but to destroy the much-loved family horse. "He was part of the family. In 2004 he was ranked 9th in the world and was the 6th best pure Arab. In 2005 he partnered me at the European Championships in Compiegne and then my son Philip rode him in Bahrain at the Young Riders World Championships," said Tricia. "But I just had to carry on at Euston, it was awful." Tricia said she had a number of other young horses at home, and a two-year-old by the same sire as Vlacq Khamul that she has bred herself. "But none are quite like him," she added. The ninth All-Africa Games is to be unveiled on Wednesday in Algiers, capital of the North African country Algeria. The following is a brief introduction of this year''s edition of the Games. According to material on the official web site of the Games, over 20 events will be held in this year''s games. The events for the disabled such as athletics, wheelchair basketball are also included in the timetable. Equestrian sport will make its debut at the ninth Games and will involve endurance riding and show jumping. The sport was first included in the Olympic Games in 1900. High-profile events will be athletics, swimming and weightlifting in which Africans conquer the world in past major international sports events. For athletics, three-time world cross country championship Edith Masai has predicted that the heated contest between Kenyans and Ethiopians will extend to Algiers. Kenya has sent its ever largest team to the pan-African event since the country hosted the 1987 Games in its capital of Nairobi.What brings more limelight to the games is that it is part of the qualifiers for the Beijing 2008 Olympic Games in some events, while in other events like table tennis, it is the sole chance for African sports people to fight for slots of the Olympic Games. Many countries have attached importance to the process of choosing team members. In addition, several athletes have said that their aim is not just to end up in the medal bracket but using the continental games to prepare for the World Championships in Osaka this August. One of the 100 horses and riders to compete in the endurance ride held at Moyston. MOYSTON - Moyston'S Endurance Ride has been hailed a success, with the event attracting more than 100 riders and their horses from across the state. The 5am start, on an icy Sunday morning, for the 80kilometre endurance ride did not deter riders from getting involved in the event. Event organiser Sioux Reid said the weekend was enjoyed by many people of all ages. "We even had one lady in her 70s participate in the 80kilometre ride," Reid said. More than 200 people attended a spit roast dinner and band performance on Saturday night, which had `lots of people up dancing'. Riders were very positive about the weekend, with many commenting on the great facilities at the Moyston recreation reserve and the beautiful scenery. "We had riders telling us that when the sun broke out of the clouds the view across the Grampians' plains was just fantastic," Reid said. The Sunday ride went smoothly thanks to the assistance of the police, CFA and many volunteers from around the region. "As long as we have that kind of support, we'll hold it again," Reid said. Heavyweight: 1st Dianne Tobin riding Commanche Man, 2nd Carl Adamson riding Bowzatus, 3rd Luke Steele riding Shadrach. Fittest horse Bowzatus. Middleweight: Equal 1st Fay Bushby riding Pyrenees Phenomenon, Fiona McAuley riding Corandirk Edison, 2nd Janine Stembridge riding Storm, 3rd Jan Scholes riding Gayland Mariah. Fittest horse Gayland Mariah. Lightweight: 1st Brittnee D'Hondt riding Breema Currowen Winston, 2nd Kelly Armistead riding Khamsin, 3rd Shannon Decker riding Kanafor Kassan. Fittest horse Breema Crrowan Winston. Junior: 1st Samantha Noble riding Springbridge Bungerdore, 2nd Jessie McKinnon riding Sandine Belcoo, 3rd Caitlyn Sidlouskis riding Kanafor Kassan. Fittest horse Springridge Bungerdore. Shaikh Nasser bin Hamad Al Khalifa led the Bahrain Royal team to victory in the Thetford International British Endurance Race for 160km, defeating a number of European champions. Shaikh Nasser finished the race in a total time of eight hours and 16.2 seconds (8.16.21) with an average speed of 19km per hour. World champion Jack Pego came second with a total time of 8.34.11, while third place went to Sofia Arinda with a total time of 8.34.12. The first stage of the 160km race, which was for 39kms, saw Shaikh Nasser place third riding his horse Basic. Shaikh Majed bin Mohammed bin Rashid Al Maktoum of UAE came first followed by his brother, Shaikh Ahmed bin Mohammed bin Rashid Al Maktoum. Bahrain's Ghazi Al Dossary finished the stage in 13th place while his teammate, Raed Mahmood, finished in 14th place. In the second stage, which was for 27kms, Shaikh Nasser came second behind Shaikh Ahmed bin Mohammed bin Rashid Al Maktoum who came first. Ghazi Al Dossary and Raed Mahmood finished 12th and 13th, respectively. In the third stage, which was for 34kms, Shaikh Nasser led the race and succeeded to remain on top until the end of the race. In the 120km race, Shaikh Daej bin Salman Al Khalifa finished in the 12th place with a total time of 6.47.58 hours, while UAE's riders Mubarak bin Shifya and Mohammed Ali came first and second, respectively. Meanwhile, the endurance royal team will be leaving today to participate in the St Gelmir endurance race which will start next Thursday for 120kms. Shaikh Khalid bin Hamad Al Khalifa will lead the team. GBR: A successful Ride day at Euston! The day also saw CEI*** 120km CEIYR*** 120km events, as well as 6 CEN classes, ranging from 100km Endurance level to 41km CR rides. In all, @100 riders particiapted in a full day of endurance. HH Sh Nasser Bin Hamad Al Khalifa riding Basic Instinct won the day at the 160km distance, followed by the 3 French riders. At the 120km, Mubarak Khalifa Bin Shafya riding Omani Iman was first to finish while in the 120km Young Rider class, Sarah Rogerson and Chantalle prevailed. BAHRAIN'S Royal Endurance team is set to participate this morning in the Thetford Endurance Race in England. This will be the second participation for the Royal team in the Thetford race with both senior and junior teams, and will serve as a preparation for the next Endurance Europe Championship. The race will consist of two different categories, including the 160-kilometre distance and the 120km event. Shaikh Nasser bin Hamad Al Khalifa will lead the Bahraini team in the 160km event along with Ghazi Al Dossary and Raed Mahmood; while Shaikh Khalid bin Hamad Al Khalifa will lead the Al Khalidiya Stables team in the 120km event along with Shaikh Daij bin Salman Al Khalifa, Shaikh Talal bin Mohammed Al Khalifa and Jaffar Merza, who will be a substitute rider. Meanwhile, the UAE's riders are also set to participate in the 120km race, led by sons of Shaikh Mohammed bin Rashid Al Maktoum, prime minister and vice-president of UAE and Ruler of Dubai. The pre-race medical check-up was held yesterday with the attendance of all the participants. Several members of the Royal Endurance squad are also set to participate in the St Gilmer Endurance race in France. The delegation is led by team manager Dr Khalid Ahmed Hassan, and includes riders Yousif Taher, Khalid Al Ruwaie, Ghazi Al Dossary, Ahmed Abdulla, Mohammed Abdulaziz, Raed Mahmood, Ahmed Abdulsamad and Jaffar Merza. The board of directors of the United States Equestrian Federation has approved the use of the new non-steroidal anti-inflammatory drug Equioxx (firocoxib). This new NSAID is the first cyclooxygenase-1 (COX-1) sparing drug to be approved by the FDA for use in horses. The drug specifically targets cyclooxygenase-2 (COX-2), an enzyme responsible for causing inflammation and pain in the body, and spares COX-1, which is associated with many beneficial functions, including production of the protective mucous lining of the stomach. Firocoxib is restricted to use outside competition until the rule allowing its use takes effect August 1, 2007. Abu Dhabi: Ever since Princess Haya Bint Al Hussain, wife of His Highness Shaikh Mohammad Bin Rashid Al Maktoum, Vice President and Prime Minister of the UAE and Ruler of Dubai, was elected as President of the International Equestrian Federation (FEI), many equestrian disciplines including endurance riding have seen changes for the good. The sport of endurance, in which the UAE are one the strongest competitors, is not only one of the fastest growing disciplines in the world but has also been evolving into a highly competitive sport. Under the FEI, the Endurance Committee has been testing and experimenting on various aspects of the sport as part of the Endurance Review which is being conducted during 2007 and early 2008. In the recent CEI Three-star 120km Bab Al Shams endurance ride held at Assisi in Italy, the organisers Assisi Endurance Lifestyle experiment with the new "Formula One Finish" which has been mooted to make endurance rides more attractive and spectator friendly. As against the current practice of waiting for all the fit horses to complete the ride within the stipulated time, in Assisi the new move involved the closing of the out gates onto the course loops one hour after the arrival of the first horse to cross the finish line. Any horse stopped by the use of the 'Formula 1' finish at a Vet Gate was still required to complete all Vet examinations and, in doing so, meet all of the parameters to continue even though not being required to do so. Ian Williams, FEI Director of Endurance who was present at the event was quoted on the FEI website as having said, "Those involved in the trial were very positive with the outcome. "We will now pass the findings on to the FEI Endurance Task Force who will consider the possibilities further. "We will need to also further trial this style of finish over 160km to gain a full picture of its effect." Speaking to Gulf News, Vijay Moorthy, Head of Endurance at the UAE Equestrian and Racing Federation said, "The 'Formula One' finish when adopted does make it easier for the horses as well as those officials involved in the event. "It makes the sport a little more spectator friendly and is easier for the media also," Moorthy added.